The change in color is too similar and it is difficult to judge. This review is about item#33139714. The reaction was good, and it was possible to check the concentration of the solution which could not be measured with a pH tester. 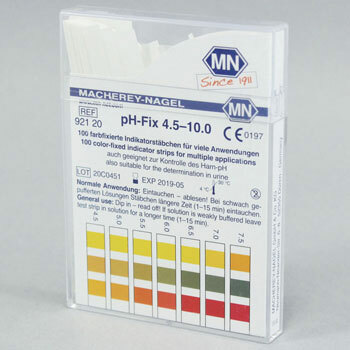 pH 3.6 to 6.1 is one that reacts, so it is a bit hard to use. This review is about item#33139662. Although it enters 100 sheets, it is more thankful if it enters into a pack and becomes a subdivision. This review is about item#33139644. Chinese made the color of the reagent is transferred to the object, but this is not such a thing and it can be used with confidence. The price is high, but I choose this one. It is very convenient for managing the pH value of water-soluble cutting fluid. Since it can be used easily even when the number of machines is large, speedy work becomes possible. This review is about item#33139696.